Gynaecology endoscopy clinic is run in Sir Ganga Ram Hospital. Endoscopy has grown with leaps and bounds. Almost all gynaecological surgeries can be performed endoscopically. Absolute contraindications of few years have been wiped out with growing surgical experience. 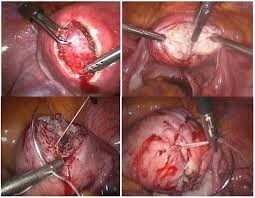 Hysterectomy (removal of uterus/ womb) can be carried out laparoscopically. Large sizes, previous multiple caesarean sections, multiple abdominal surgeries and cases of severe endometriosis are no more contraindications. Myomectomy (removal of fibroids, preserving the uterus) of any positionn, size and numbers can now be done through minimal access approach. Infertility surgeries for surgical correction to facilitate conception and child bearing are carried out through laparoscopy and hysteroscopy. These include surgeries for tubal block, tubal distortion, endometriosis, endometrioma, ovarian cyst, pelvic inflammatory disease, uterine fibroids, polyps, synechiae. LUNA – Laparoscopic Uterosacral Nerve Ablation. Vault prolapse is repaired with mesh using tackers to fix the mesh on the sacrum laparoscopically. Endometriosis corrective / radical surgeries are carried out for inability to conceive, pain, large endometrioma. Cancer surgeries which are operable for cancer body uterus, cervix and ovaries are done laparoscopically. Hysteroscopic surgeries are carried out through natural passage without any abdominal cut/ stitches. Endoscopic correction leads to minimal pain, early recovery and discharge. The patient is able to return to routine work soon unlike open surgeries. The level of surgeries is world-class with surgeons trained from Europe and USA. Hysterectomy is the commonest gynecological surgery. With the advent of laparoscopy almost all hysterectomies can be managed endoscopically. 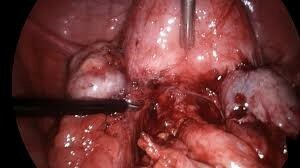 With increasing surgeon experience the absolute contra indications for laparoscopic hysterectomy are decreasing. Large uterine size, multiple caesarean sections, previous multiple abdominal/ pelvic surgeries, diagnosed cases of endometriosis, cancer of reproductive of organs, can all be managed laparoscopically without increasing patient morbidity or prolonging hospitalization.